Train Hard : with a little rest this week! With the exception of the outing last night, I have had to go easy this week on the training-front after sustaining a rather silly injury whilst at Thorpe Park on my day off from work Monday! Whilst on one of the roller coaster rides, I forgot to brace myself properly and as a result suffered a neck injury as I was thrown around the Surrey countryside at 80 miles an hour, with several g’s forcing my neck into a rather unnatural position! After a visit to the doctor, I was given painkillers to reduce the pain and inflammation, and muscle relaxants to let the muscles come out of spasm and rest and repair. Let’s be honest, not great the week of a big regatta – should have factored that in when we were planning the day out! 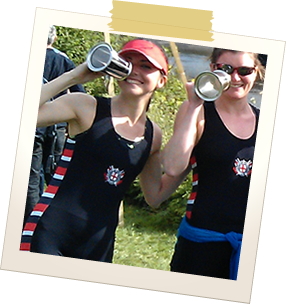 My neck is feeling a hundred times better than it was Monday evening, and I’m hoping to wake up tomorrow in as little discomfort as possible, as tomorrow is the Twickenham Regatta – my first regatta racing as an Intermediate, so it’s rather exciting! If there is one good thing that has come out of this rather irritating injury, it is that it has highlighted the underlying issue I have in my neck and shoulders from sitting at a desk, and the importance to stretch all muscles – even if they do not appear tight or sore – to reduce future problems and injuries from happening. All great with hindsight, hey! So this evening we have the usual faff of derigging the boats and loading them onto the trailer ready for the race tomorrow. We’re hoping to make it as quick-a-job-as-possible – the other intermediates find it hilarious to watch us each time we load and unload the trailers, but I think they forget that they were once novices too! Practice makes perfect, and we’ve had a fair bit of experience of it all now, so it should be a pretty straightforward job … we’ll see!